I see the same in the 44th & France Small Area Plan goings on. Definitely. I've talked about it at length with my parents too (I grew up here and they still live here too, but will probably be downsizing in the next 10 years -- likely to a condo in the 44th/50th area). My feeling is the cat is out of the bag and while some of the people fighting against density might get a win here and there (hopefully we can avoid too many bad decisions) eventually it's going to come. Simply because 1) it's a desirable place to live and greenfield development sites are pretty much gone, 2) the city council knows the only way to grow the tax base and remain a vibrant city with all the amenities everyone wants is to increase density, and 3) there is already so much momentum with people living in dense arrangements near Southdale, etc. that have the ability to vote for more urban-centric candidates that it becomes a bit self fulfilling. In other words my assessment is that the war may still go on for quite a while but it's already likely won. If a parcel is zoned 2-family/duplex, should you be able to build a SFH without a variance or re-zoning? What do most cities do/allow? It allows SFHs in St Paul, and I'd imagine it's that way most places. Usually SFHs are only phased out as a by-right land use in higher density/mixed use zoning classifications. If cities are trying to increase density, a little at a time (“gentle density”, as Brent Toderian calls it), and if a landowner can build a SFH by-right on land that’s zoned duplex, why wouldn’t a city zone all SFH areas duplex? I suppose it kind of depends on what the intent is of the ordinance. If the purpose to ensure a minimum density of people, or a minimum level of tax base, I can see why you'd want to restrict single-family homes in that zone. (Even a really nice single-family home is unlikely to generate as much property tax as a duplex on the same site.) But if the intent is coming from the opposite direction -- that single-family home area must be protected, and designating something for duplexes just means it would be less "damaging" to build more there, then I don't see why we would restrict it. But I sort of agree with your second post -- flexibility to build duplex or single-family makes a lot of sense. And in a way I think it can be best for a neighborhood when you get an organic mix of both. Wooden Hill Brewing Co. is slated to open at the end of February, pending final City Council approval, in an industrial building at 7541 Bush Lake Road. Wooden Hill Brewing will start with seven brews on tap when it opens, including a couple of IPAs, a chocolate stout, a light brown ale (that tastes like Cinnamon Toast Crunch cereal) and a Kolsch German ale. Wooden Hill Brewing has 9,000 square feet of space plus an outdoor patio when the weather turns nice. License approved for Wooden Hill Brewing at tonight’s city council meeting. Many people will scoff at the “poor rich suburb”, but this just shows that Edina needs affordable housing as much as any place does. And by affordable housing, we’re probably not talking about single family homes—which is why I think the city council is doing the right thing by pushing for selective density and actual affordable housing (apartments & condos), rather than just taking the penalty from developers who didn’t provide affordable housing. I dunno, I think this rolls down hill on the rest. Those 88 home shoppers in the market for $500K houses in the SW inner ring suburbs just outbid those wanting $400K houses in neighborhoods nearby. And on down. Edina needs affordable housing MORE than everybody else in the metro. It has practically none, and that’s no accident. It’s long overdue, but I don’t see where the city could add enough units (e.g. at least 1000-1500) to bring the city closer to par....not without clustering them all in one place. I can’t think of too many good places for it either, except the Southdale area, with its redevelopable space and access to transit. AND......current residents would swoon with anger! 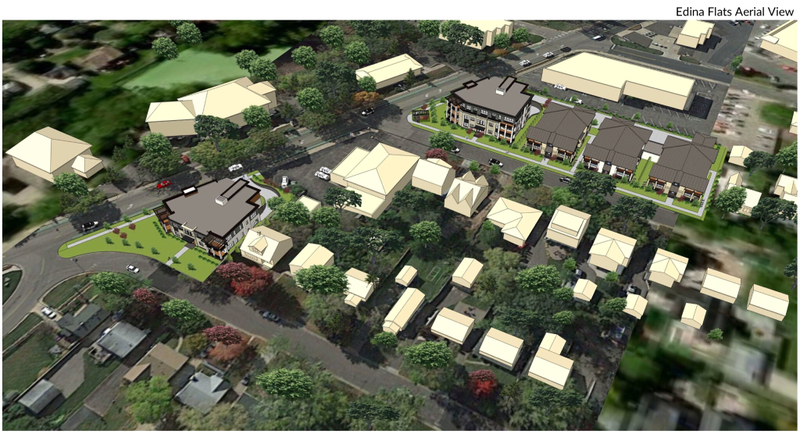 Images of the Edina Flats proposal coming to Valley View and Wooddale area. The proposal is the two separate sites, one at Oaklawn and Valley View (4 units) and the larger one at Kellogg and Valley View (6 in the 3-story building, and 3 each in the two story buildings). Kinda nice missing middle that adds 19? units of housing. 3 triplexes, 1 fourplex, and 1 sixplex? Yes, that’s exactly right. Alternatively, the 2 upper units in each triplex could be rented as single units, making them duplexes. I agree this is nice missing middle housing for that area. “We felt we fulfilled all those requirements,” says Bernardi, who is scouting to find another site in Edina for a revised version of the Estelle. “I’d like to use the same plan because I spent so much money … we’re trying to see if we can reutilize those plans on another site.” Bernardi did not elaborate on how much he spent on the Estelle proposal. Alright this might seem out of nowhere but does Edina have any rules/regulations on urban chicken coops, I only ask since yesterday I was biking on the 9 mile trail and I see one next to the trail in front of an apartment building. I figure they must be allowed since it must of gotten out somehow or got insanely lost from somewhere else. Yes, there is a recent chicken ordinance.